Go to our Facebook page for daily updates. 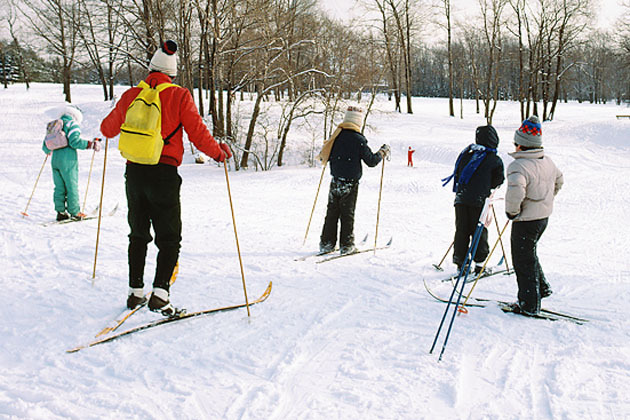 Whether you prefer challenging trails through wooded areas or acres of open space to traverse, Westchester County parks and golf courses offer an ideal setting for cross country skiing. You must provide your own equipment. No rentals are available. Conditions permitting, cross country skiing is allowed seven days a week during daylight hours. Please note that sledding is allowed only at the parks indicated, and only at the golf courses** when they are closed for the season. **Due to construction at Maple Moor Golf Course, there is no skiing or skating allowed. Westchester County’s lakes and ponds provide ideal locations for scenic outdoor ice skating. As with skiing, you must bring your own skates. No rentals are available. Ice is checked daily at all locations for safety and conditions. When the white flag with the green ball or sign is posted indicating safe conditions, ice skating is permitted seven days a week during daylight hours. For your own safety, always check conditions before heading out to the park. For more information call (914) 864-PARK. Admission is free except at Ward Pound Ridge Reservation where parking is $5 with a Park Pass, $10 without a pass. *Sledding permitted only on golf courses when they are closed for the season.